A Dave-less group gathered in the car park behind Bents Garden Centre and after the usual greetings and chit chat set off on the familiar route around Windy Bank Wood. Within the first two to three hundred yards we had a good number of sightings of Swallow, Kestrel, Collared Dove and others, but clear views of a Whitethroat perched on a telephone wire, singing its heart out, and of a charm of Goldfinches, ‘cheeping’ as they overflew us, were the highlights. This promising start, however, was not maintained, and for the rest of the morning we had to work hard to add to our day list. As we approached the area of the Wood itself, the presence of birds was made clear by calls and song, but the heavily leafed trees made identification or even location difficult. One or more Chiffchaff teased us, calling first on one side of the track then on the other, but sighting this bird proved impossible. Warblers, too, were in evidence and one in particular that perched atop a fir tree was studied in some detail, before the consensus decided it was a Willow Warbler. 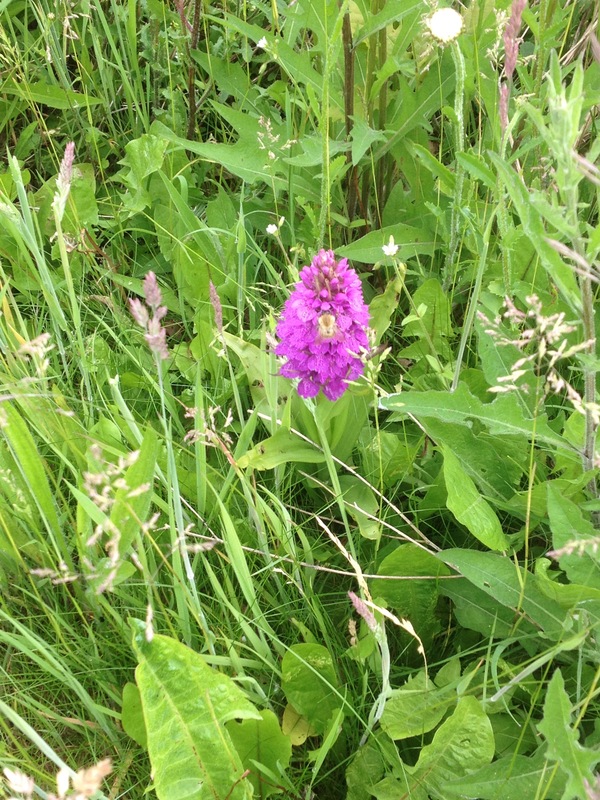 The next section of the ramble proved strangely bird-less, although the colourful meadows on either side of the path with a variety of grasses, ox-eye daisies and bright pink pyramidal orchids were a joy to behold. The growing strength of the sun was, by this time, beginning to bring out the insects, and bumble bees, dragonflies and the odd butterfly (especially Peacock and Tortoiseshell) were noted as we passed along. Clear views of a Buzzard resting on one of the gantries over the railway were gained as we began to head back towards the entrance to the site, but little else showed until the trail again took us into the woods, where a fledgling Wren isolated on a dead branch with its parents alarming loudly in the bushes below attracted our attention. The threat, however, was not, as we at first thought, our presence, but that of a stoat further back in the undergrowth. This predator eventually made itself scarce, frightened off by us, rather than the noisy wrens – an example of benevolent human intervention? Having spotted what appeared to be a ‘giraffe’ at Windy Bank Farm, the return to the car park was a pleasant stroll, but largely bereft of new bird sightings, although there was plenty of activity on the Glaze, where several young families of Mallard were swimming back and forth and dark blue dragonflies were out in number, skimming over the water.